Before reading the articles (sections) below, please note the following preliminary terms, which constitute an inseparable part of the Terms and Conditions of Use, and which utilize some of the definitions specified in the Definitions section below. As used in the Become A Canadian Terms and Conditions of Use, the terms you, your or user are synonymous and used interchangeably to make reference to the individual using in any way the BecomeACanadian.org Website, Offered Services, Products and/or Software. You acknowledge and agree that by visiting or using any of Become A Canadian’s Websites or Offered Services and Products, you are entering into a legally binding contract that shall govern any use of Become A Canadian’s Websites or Offered Services and Products by you or any third party on your behalf. Additionally, you hereby agree to the use of electronic communication in order to enter into contracts, place orders and to the delivery or acceptance of notices, policies and records of transactions initiated or completed through Become A Canadian’s Websites or Offered Services and Products. Further, you hereby waive any requirements or rights under any regulations or laws in any jurisdiction which require an original (non-electronic) signature or delivery or retention of non-electronic records, to the extent allowed under applicable mandatory law. When you visit or use any of Become A Canadian’s Websites or Offered Services and Products, you are aware and acknowledge that Become A Canadian (BecomeACanadian.org) is a private company and is not and does not pretend to be, an agency of the Canadian Government or otherwise connected in any way whatsoever to the Government of Canada. Become A Canadian is not part of the Canadian Government or immigration authorities, or a law firm. In this respect, Become A Canadian does not intend to give nor does it claim to provide legal advice or solutions regarding a person’s particular problems. Furthermore, you should be aware that the Government of Canada has the authority to modify or cancel the various visa and/or immigration Programs presented in the Website at any time, and upon the approval of Canada’s governmental or legislative bodies. Become A Canadian and the Website shall not be held responsible in case the Canadian Government (or one of its Agencies) suspends, prohibits, cancels or otherwise prevents (the “Prevention Announcement”) the various visa and/or immigration Programs or the Offered Benefits, Services or Products, for any reason, and will not provide refund for payments that were made prior to any such Prevention Announcement. 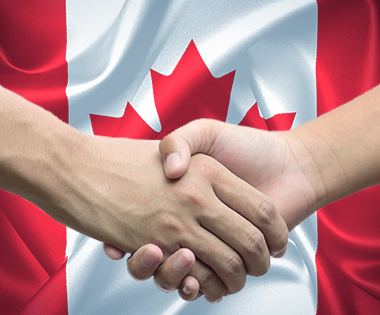 Become A Canadian, BecomeACanadian and BecomeACanadian.org mean Become A Canadian and/or any of its owners, officers, directors, employees, agents, representatives, subsidiaries, divisions, affiliates, or licensors. The BecomeACanadian.org website is owned by the EU Company, Immigration Solutions, S.L., address: Calle Arte 21, 1º B, 28033, Madrid, Spain. Become A Canadian’s Websites or Website or Site means any and all contents, elements and the ‘look and feel’ of the Website available under the domain www.BecomeACanadian.org as well as all related websites owned, operated or controlled by Become A Canadian. Become A Canadian’s Offered Services and Products or Offered Services and Products means the use of any of Become A Canadian’s Services, Products and Software, if applicable, and related services available via any of Become A Canadian’s Websites, whether they are defined as Paid Products, as defined herein, or any other products provided by Become A Canadian. Become A Canadian’s Software or Software means Become A Canadian’s proprietary web-based software. The terms you, your or user are synonymous and make reference to the individual using in any way the BecomeACanadian.org Website, Offered Services, Products or Software. Intellectual Property means any and all intellectual property rights, including without limitation, intangible legal rights, titles and interests, evidenced by or embodied in: (i) any invention (whether patentable or un-patentable and whether or not reduced to practice), all improvements thereto, and all patent, patent applications and patent disclosures; (ii) any work of authorship, regardless of copyright ability, copyrightable works and all copyrights; (iii) all trade secrets and confidential information; and (vi) any other similar rights, in each case on a worldwide basis. Become A Canadian grants you with a limited license to access and make personal use of Become A Canadian’s Websites and Offered Services and Products and not to download (other than page caching) or modify it, or any portion of it. This license does not include any commercial use or resale of any of Become A Canadian’s Websites or Offered Services and Products or its contents; any derivative use of any of Become A Canadian’s Websites or Offered Services and Products or its contents; or any use of data mining, robots, or similar data gathering and extraction tools. Any of Become A Canadian’s Websites or Offered Services and Products or any portion thereof may not be copied, duplicated, reproduced, sold, resold, visited, or otherwise exploited for any commercial purpose. You may not frame or use framing techniques to enclose any logo, trademark, or other proprietary information (including text, images, page layout, or form) of any of Become A Canadian’s Websites or Offered Services and Products or any part thereof. You may not utilize any Meta tags or any other “hidden text” using Become A Canadian’s name or trademarks. You are granted with a limited, revocable, and nonexclusive right to create a hyperlink to Become A Canadian’s Website so long as the link does not portray Become A Canadian or any of its Services and Products, including without limitation, Become A Canadian’s Offered Services or Products or Software or Websites, in a misleading, false, derogatory, or otherwise offensive manner. You may not use any Become A Canadian logo or other proprietary graphic or trademark, including without limitation, as part of a link, without Become A Canadian’s express written permission. You shall not attempt to access any other of Become A Canadian’s systems, programs or data that are not made available for public use. You shall not authorize, permit, cause or undertake the modification, creation of derivative works, translation, reverse engineering, decompiling, disassembling or hacking of any of Become A Canadian’s Website’s or Offered Services, Products or Software or any part thereof. The information on Become A Canadian’s Websites is protected by copyright: Copyright Become A Canadian Inc. All Rights Reserved. You acknowledge and agree to use any of Become A Canadian’s Websites or Offered Services, Products or Software solely for lawful purposes. In this respect you may not, without limitation (a) intercept or monitor, damage or modify any communication which is not intended for you, (b) use any type of virus, worm, Trojan-horse, spider, time bomb or any other instructions or codes that are designed to damage, distort, delete or disassemble any of Become A Canadian’s Websites or Offered Services, Products or Software or communication, (c) send any unsolicited commercial communication not allowed by applicable law, or (d) expose any other user to material which is unlawful, offensive, indecent, profane, obscene, vulgar, harmful to minors, harassing, threatening, abusive, defamatory, hateful, racially, ethnically or otherwise objectionable material of any kind, including, but not limited to, any material which encourages conduct that would violate the rights of others, constitute a criminal offense or otherwise violate any applicable local, state, national or international law or is objectionable in any other way. Additionally, you declare that the source of funds used by you to utilize the Offered Services, Products and/or Software used through the Website is not illegal and that you will not use the Offered Services, Products and/or the Software and/or the Websites in any way as a money transfer system. You will not use the Offered Services, Products and/or the Software and/or the Websites for any fraudulent or unlawful activity or prohibited transaction (including money laundering) under any law. You will be responsible for, and indemnify and hold harmless Become A Canadian against any claim arising from any material that you transmit or post. With the exception of credit card numbers and other personal details that you are required to fill in on the forms as part of the use of the Offered Services, Products and/or Software, Become A Canadian does not want to receive confidential or proprietary information from you through the Website. Any non-personal information or material sent to Become A Canadian will be deemed NOT to be confidential. By sending Become A Canadian any non-personal information or material, you grant Become A Canadian an unrestricted, irrevocable license to use, display, perform, reproduce, modify, distribute and transmit those materials or information, and you also agree that Become A Canadian is free to use for any purpose any concepts, ideas, know-how or techniques that you send us. Notwithstanding the Confidential Information section above, upon your registration you explicitly authorize Become A Canadian to transmit via the Internet, telephone, facsimile (FAX) or any other means of communications, commercial, promotional material and advertisements of any kind and type in its sole discretion, whether its own or of a third party. If you want to stop receiving such material and advertisement, you may do so by informing Become A Canadian. Become A Canadian and the Website take every precaution to protect users’ information. When users submit sensitive information via the Website, the information is protected both online and off-line. When users are asked to enter sensitive information (such as credit card number), such information is encrypted and is protected with the Secured Socket Layer (SSL) encryption software. When on a secure webpage, such as the payment reply form, the lock icon on the bottom of Web browsers such as Microsoft Internet Explorer becomes locked. Additionally, the Website operates by the official PCI security standards. While we have taken significant measures to ensure the security of information submitted in using the Offered Services, Products and Software, Become A Canadian and the Website cannot guarantee the security of information collected during your use of the Offered Services, Products and Software and shall not be liable in any way if your data is compromised. If you object to your Information being transferred or treated in this way, please do not register. There is a global standard for the Internet in which IP addresses are allocated according to countries or certain areas. During registration, Become A Canadian may use such allocation to identify the area you are calling and/or connecting from (this is done without identifying you personally). Your use of any of Become A Canadian’s Websites or Offered Services and Products must be made from the area where you have registered from. You may not, by any means, cause Become A Canadian to misidentify the area where you are registering from (including without limitation by the use of a proxy or any other service or software). You agree and acknowledge that by not complying with such terms, you may cause Become A Canadian to be in non-compliance with or in violation of any applicable law for which you shall be held fully responsible. The user acknowledges that Become A Canadian may, at its sole discretion, grant limited access to its websites and/or servers to third party Canadian immigration practitioners who are authorized representatives under Canadian law for the purpose of providing Canadian immigration services for a fee. The granting of such access to the Become A Canadian websites and/or servers does not establish a consultant-client or an attorney-client relationship between the user and the authorized representatives. The user acknowledges and consents to access by the authorized representatives and individuals appointed by them, to personal information and documents uploaded by the user to the Become A Canadian websites and/or servers. The authorized representatives, under agreement with Become A Canadian, may evaluate the qualifications of the user for a Canadian immigration visa. Such evaluations are performed on the server-end and are done on an as-is basis. These preliminary eligibility evaluations do not constitute personal immigration advice and do not guarantee the issuance of an immigration visa or other document to the user. Qualified users/clients who are seeking services which fall within the scope of Section A91 of the Immigration and Refugees Protection Act of Canada will be required to sign a personal client retainer agreement with an authorized representative. Become A Canadian has the right at any time and for any reason to update, modify or discontinue any feature or aspect of any of Become A Canadian’s Websites, Offered Services, Products and/or Software, including but not limited to its availability, pricing, content or functionality. At its sole discretion, and without derogating from the above said, Become A Canadian reserves the right to add additional features or functions, or subtract or change such or to provide programming updates, upgrades or fixes, to any of Become A Canadian’s Websites, Offered Services, Products and/or Software. You agree and acknowledge that Become A Canadian has no obligation to make available to you any previous or subsequent versions of any of Become A Canadian’s Websites, Offered Services, Products and/or Software. You agree and acknowledge that Become A Canadian is a private company and that any fee you pay is designed to cover Become A Canadian’s time and costs in return for the handling, storage and processing of your information and documents. Payment of all fees and charges to Become A Canadian, if applicable, must be made by a valid credit or charge card and/or other forms of accepted payment as designated on the Website (hereinafter “Paid Products”). If any problem regarding any subject occurs, including financial reimbursement, please do not hesitate to contact our customer service department. In case of solving the problem unilaterally by the customer through cancellation of transaction by the bank, Become A Canadian reserves the right to contact the bank and submit a re- presentment letter in order to claim for the funds back. Furthermore, Become A Canadian may, at its sole discretion, cease to provide the Offered Services, Products and/or Software to specific users or to users paying with particular credit cards or debit cards. Become A Canadian retains the right to conduct credit checks on all users with third party credit agencies, on the basis of the information provided to us on the application or by you in any other manner. Become A Canadian retains the right to use third party electronic payment processors and/or financial institutions to process payments made by you in connection with your use of the Offered Services, Products and/or Software. In the event of fraudulent payment and/or suspected fraudulent payment, including the use of stolen credit cards or debit cards, or any other fraudulent activity (including any charge-back or other reversal of a payment), Become A Canadian retains the right to block a user’s account and to reverse any refund that may have been issued. Become A Canadian shall be entitled to inform any relevant authorities or entities (including credit reference agencies) of any payment fraud or otherwise illegal activity, and may utilize collection services in order to recover payments. Only you are allowed to use your Become A Canadian client user identification (ID) number (i.e., “USERNAME”) and password. You are not authorized to permit any other individuals to have access to or utilize your user ID number or password. Furthermore, you are personally responsible for the use of any of Become A Canadian’s Websites or Offered Services and Products made under your user identification number, as well as for maintaining the confidentiality of your user ID number and password. For security reasons, unless noted otherwise, Become A Canadian shall not disclose your user identification number (i.e., “USERNAME”) or password if you forget it or lose it other than by sending it to your email address which you provided when you registered with Become A Canadian. Become A Canadian cannot guarantee that you shall always be able to communicate by using any of Become A Canadian’s Websites or Offered Services, Products or Software, nor can Become A Canadian guarantee that you can communicate without delays, disruptions or communication-related flaws, or that all your communication shall always be delivered. Become A Canadian shall not be liable for any such delays, disruptions or other omissions in any communication experienced when using the Websites, Offered Services or Products or Software, even if such was incurred by or due to Become A Canadian. Become A Canadian shall not be responsible or held liable for any disturbances or malfunctions that any of Become A Canadian’s Websites or Offered Services, Products or Software may cause to any other application or software, or to any computer hardware system or any part thereof, including any information or data contained in such. Become A Canadian may, without any prior notice, and at its sole discretion, suspend any of Become A Canadian’s Websites or Software or Offered Services or Products, including Paid Products, or any parts thereof, for updates, maintenance work, or for any other reason, or terminate any of such Websites or Offered Services or Products or Software. Become A Canadian shall not be liable or responsible with respect to or in connection with such suspension or termination. Become A Canadian’s Websites and Offered Products may include a pre-release ‘beta’ version of its Websites and Offered Services or Products which may be incomplete and may contain inaccuracies or errors that could cause failures or loss of data. Become A Canadian’s Websites and Offered Services and Products and all information, content, materials, products and services included on or otherwise made available to you through any of Become A Canadian’s Websites or Offered Services and Products are provided on an “as is” basis. Become A Canadian and any of its owners, officers, directors, employees, agents, representatives, subsidiaries, divisions, affiliates, licensors or suppliers make no representations or warranties of any kind, expressed or implied, as to the operation of any of Become A Canadian’s Websites or Offered Services, Products or Software or the information, content, materials, products or services included on or otherwise made available to you through such Websites or Offered Services and Products. Without derogating from the aforementioned, you understand and acknowledge that the content of the communication spread by the use of any of Become A Canadian’s Websites or Offered Services, Products or Software is entirely the responsibility of the individual or entity from whom such content originated. Additionally, Become A Canadian’s Websites or Offered Services and Products may contain links to other websites and you agree and acknowledge that the content of such is entirely the responsibility of its respective authors. Therefore, you may be exposed to content that is offensive, harmful to minors, indecent or otherwise objectionable and your linking to such websites is at your own risk and you agree and acknowledge that Become A Canadian shall not be liable for any type of communication spread by means of any of Become A Canadian’s Websites or Offered Services and Products. Subject to the terms and conditions of the Privacy Statement, any material or communication you transmit or post in connection with your use of the Offered Services or Products will be treated as non-proprietary and non-confidential. You assume full responsibility for anything you transmit or post, and you grant Become A Canadian the right to copy, edit, distribute and publish any information or content you transmit or post for any purpose, including but not limited to registration for the Canadian visa program. If you object to your Information being used in this manner, please do not register. In this respect you should be aware that if you voluntarily disclose personal information (e.g. user name, email address) on a chat room, bulletin board or on any other user or member generated webpages, that information can be collected and used by others and may result in unsolicited messages from other parties. The Offered Services and Products and the Website may include chat rooms, bulletin boards and other user and member created webpages which allow you and other users and members to post information, provide feedback to Become A Canadian, and interact in real-time. You acknowledge that Become A Canadian and its affiliates do not control the information available on the chat rooms, bulletin boards and other user and member generated webpages and that any opinions, statements, advice, services, offers or other information or content presented or disseminated on any chat room, bulletin board or on any other user or member generated webpages are those of their respective authors who are solely liable for their content. Become A Canadian retains the right, in its sole discretion, to edit, refuse to post or remove any material submitted to or posted on the chat rooms, bulletin boards or on any other user or member generated webpages. You understand that the Canadian Visa Programs are based on a Canadian authority’s evaluation procedure and, therefore, there is no guarantee that a visa to Canada will be granted. All applications submitted, as well as applications submitted through the Offered Services, Products and/or Software, receive an equal treatment by the Canadian authorities. Become A Canadian is a private company and is not involved in any way in issuing immigration visas. Choosing Become A Canadian’s Offered Services or Products does not guarantee a better or expedited handling. Become A Canadian, without limiting other remedies, may limit, suspend, or terminate your use of Become A Canadian’s Websites, Offered Services and Products and/or Software (including Paid Products) and delete your user account and/or user identification number, and the use of any content or other material contained therein, at any time, without any prior notice, with or without cause and without any recourse, and with immediate effect. Become A Canadian shall not be liable in respect for any damage caused by or arising of or in connection with the restriction, suspension or termination, irregardless of the reason thereof. ANY OF BECOMEACANADIAN’S WEBSITES OR OFFERED SERVICES, PRODUCTS OR SOFTWARE ARE PROVIDED ‘AS IS’, WITH NO WARRANTIES WHATSOEVER; BECOMEACANADIAN AND ANY OF ITS OWNERS, OFFICERS, DIRECTORS, EMPLOYEES, AGENTS, REPRESENTATIVES, SUBSIDIARIES, DIVISIONS, AFFILIATES, LICENSORS OR SUPPLIERS DO NOT, EITHER EXPRESSED, IMPLIED OR STATUTORY, MAKE ANY WARRANTIES, CLAIMS OR REPRESENTATIONS WITH RESPECT TO ANY OF BECOMEACANADIAN ‘S WEBSITES OR OFFERED SERVICES, PRODUCTS OF SOFTWARE, INCLUDING, WITHOUT LIMITATION, WARRANTIES OF QUALITY, PERFORMANCE, NON-INFRINGEMENT, MERCHANTABILITY, OR FITNESS FOR USE OR A PARTICULAR PURPOSE. BECOMEACANADIAN AND ANY OF ITS OWNERS, OFFICERS, DIRECTORS, EMPLOYEES, AGENTS, REPRESENTATIVES, SUBSIDIARIES, DIVISIONS, AFFILIATES, LICENSORS OR SUPPLIERS FURTHER DO NOT REPRESENT OR WARRANT THAT BECOMEACANADIAN ‘S WEBSITES OR OFFERED SERVICES, PRODUCTS OR SOFTWARE WILL ALWAYS BE AVAILABLE, ACCESSIBLE, UNINTERRUPTED, TIMELY, SECURE, ACCURATE, COMPLETE AND ERROR-FREE OR WILL OPERATE WITHOUT PACKET LOSS, NOR DO BECOMEACANADIAN AND ANY OF ITS OWNERS, OFFICERS, DIRECTORS, EMPLOYEES, AGENTS, REPRESENTATIVES, SUBSIDIARIES, DIVISIONS, AFFILIATES, LICENSORS OR SUPPLIERS WARRANT ANY SUCCESS OR ACCEPTANCE OF A VISA THROUGH ANY OF BECOMEACANADIAN ‘S WEBSITES OR OFFERED SERVICES, PRODUCTS OR SOFTWARE. Become A Canadian’s Websites may allow you to access third party websites. Your access to and use of any third party websites, including any information, goods or services made available from such websites, is governed by the terms and conditions found at each third party website, if any. You agree to indemnify, defend and hold harmless Become A Canadian, its owners, officers, directors, employees, agents, representatives, subsidiaries, divisions, affiliates, licensors or suppliers, from and against all demands, losses, expenses, damages and costs, including reasonable attorneys’ fees, made against Become A Canadian by any third party due to or arising out of or in connection with your visit or use of any of Become A Canadian’s Websites or Offered Services, Products of Software. You agree to defend, hold harmless and indemnify Become A Canadian from and against any and all liabilities, damages, actions, costs, expenses, including without limitation attorneys’ fees, resulting from or arising of any and all third party claims, including without limitation your own. Since some jurisdictions do not allow some of the limitations or exclusions as set forth above, some of these limitations or exclusions may not apply to you. In such event, the liability will be limited as far as legally possible under the applicable legislation. YOU AGREE AND ACKNOWLEDGE THAT BECOMEACANADIAN, ITS OWNERS, OFFICERS, DIRECTORS, EMPLOYEES, AGENTS, REPRESENTATIVES, SUBSIDIARIES, DIVISIONS, AFFILIATES, LICENSORS OR SUPPLIERS SHALL HAVE NO LIABILITY IN CONNECTION WITH OR ARISING FROM YOUR USE OR VISIT OF ANY OF BECOMEACANADIAN’S WEBSITES OR OFFERED SERVICES, PRODUCTS OR SOFTWARE. IN NO EVENT SHALL BECOMEACANADIAN, ITS OWNERS, OFFICERS, DIRECTORS, EMPLOYEES, AGENTS, REPRESENTATIVES, SUBSIDIARIES, DIVISIONS, AFFILIATES, LICENSORS OR SUPPLIERS BE LIABLE, WHETHER IN CONTRACT, WARRANTY, TORT (INCLUDING NEGLIGENCE), PRODUCT LIABILITY OR ANY OTHER FORM OF LIABILITY, FOR ANY INJURIES, INDIRECT, INCIDENTAL, SPECIAL OR CONSEQUENTIAL DAMAGES (INCLUDING WITHOUT LIMITATION ANY LOSS OF DATA, INTERRUPTION, COMPUTER FAILURE OR PECUNIARY LOSS) ARISING OUT OF THE VISIT OR USE OF ANY OF BECOMEACANADIAN’S WEBSITES OR OFFERED SERVICES, PRODUCTS OF SOFTWARE OR INABILITY TO USE SUCH, EVEN IF BECOMEACANADIAN, ITS OWNERS, OFFICERS, DIRECTORS, EMPLOYEES, AGENTS, REPRESENTATIVES, SUBSIDIARIES, DIVISIONS, AFFILIATES, LICENSORS OR SUPPLIERS HAVE BEEN ADVISED OF THE POSSIBILITY OF SUCH DAMAGES. YOUR ONLY RIGHT OR REMEDY WITH RESPECT TO ANY PROBLEMS, DISSATISFACTION OR DAMAGE IN CONNECTION WITH ANY OF BECOMEACANADIAN’S WEBSITES OR OFFERED SERVICES, PRODUCTS OR SOFTWARE OR THE USE OR VISIT THEREOF IS TO CEASE USE OF SUCH WEBSITES OR OFFERED SERVICES, PRODUCTS OR SOFTWARE. If, notwithstanding the other provisions of this User Agreement, Become A Canadian is found to be liable to you for any loss or damages which arise out of or is any way connected with the use of this Website or the Offered Services, Products or Software, Become A Canadian’s liability shall in no event exceed the lesser of (a) the amount paid by you for the Paid Product; or (b) $50.00 (Canadian Dollars). Since some jurisdictions do not allow some of the limitations or exclusions as set forth above, some of these limitations or exclusions may not apply to you. In such event the liability will be limited as far as legally possible under the applicable legislation. Immigration laws and regulations change frequently and their application can vary widely based upon the specific facts and circumstances involved. You are responsible for consulting with your own professional immigration advisors concerning your specific circumstances. Become A Canadian disclaims any responsibility for the accuracy or adequacy of any positions taken by you in your applications. Dispute Resolution. You agree that all matters relating to your access to or use of the Website, Offered Products and/or Software, including all disputes, will be governed by the laws of Cyprus without regard to its conflict of law’s provisions. You agree to the personal jurisdiction by and venue in the District Court in Larnaka, Cyprus, and waive any objection to such jurisdiction or venue. Any claim under the User Agreement must be brought within one (1) year after the cause of action arises, or such claim or cause of action is barred. In the event of any controversy or dispute between Become A Canadian and you arising out of or in connection with your use of the Website, Offered Products and/or Software, the parties shall attempt, promptly and in good faith, to resolve any such dispute. If the parties are unable to resolve any such dispute within a reasonable time (not to exceed thirty (30) days), then either party may submit such controversy or dispute to mediation. If the dispute cannot be resolved through mediation, then the parties shall be free to pursue any right or remedy available to them under applicable law.